Modern facilities await you at the Tuolumne County FIT. 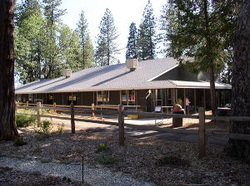 The Sierra Outdoor School is located in the heart of the Sierra Nevada within the Stanislaus National Forest. The location offers a wonderful opportunity for hands-on learning of forest management and environmental education. The camp is located at 4,100 feet, within the Stanislaus National Forest in the Sierra Nevada mountains. We are in Gold Rush country, about 30 minutes from the historic town of Sonora, and two hours from Yosemite National Park. Instruction is provided in both the classroom and in the surrounding forest. We provide opportunities for educators to learn about the management of different private and public forested lands, fire ecology, biological diversity, and water quality as it all relates to us on a watershed level. Field trips will be taken to nearby logging sites, saw mills, and a co-generation plant. "I loved that we were living in the place we were learning about. What a better way to get a deeper understanding is the than to see the whole process from start to finish. I feel this program is so valuable and can't believe it is free to teachers. So many people would benefit so much from coming here." "Learning in a unique community of new people and landscape. Being educated in something so new. Learning more about the details of all nature around us and how it works together and in our society today. Simply enjoying nature and being so far removed from life in the big city for a week."